Using the landscape as inspiration, the annual gathering gives audiences a one-of-a-kind listening experience. 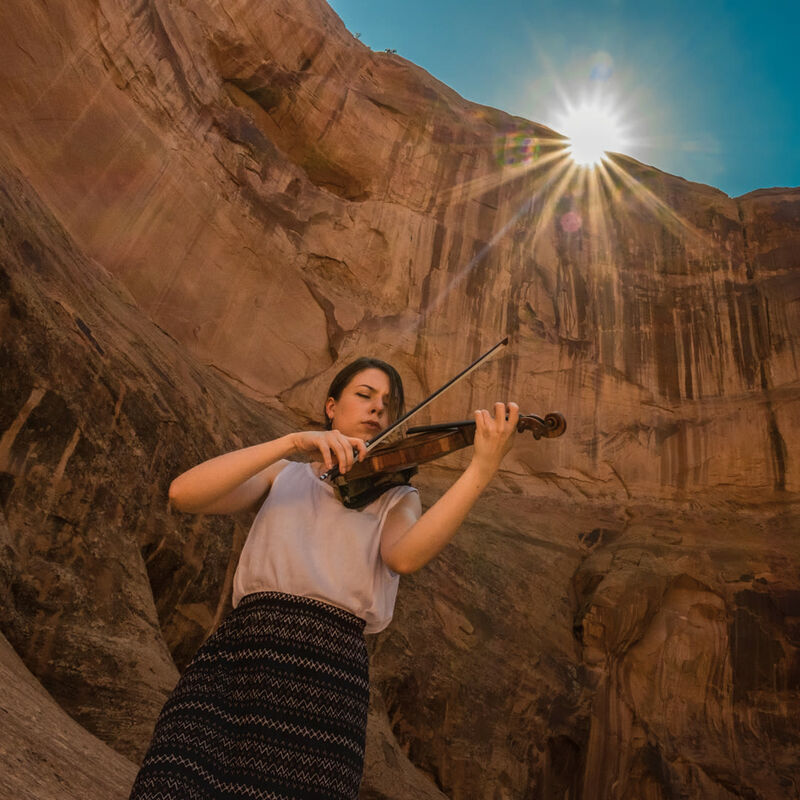 Violinist Tessa Lark performs in Moab. I turn down a dirt road off Highway 128, the serpentine Scenic Byway along the Colorado River that ends in Moab, Utah. Eroded red sandstone cliffs jut out of the landscape; a rock formation known as the Priest and Nuns looms on the right. It’s the kind of road I’ve traveled for years here on my way to mountain-biking trails. Fifteen minutes later, I’m standing on a shaded patio, sipping a glass of rosé and chatting with virtuoso jazz pianist Marcus Roberts, the evening’s performer, and Jamie Bernstein (daughter of Leonard). Later on, about 75 of us gather in a ranch house living room as Roberts sits at the Steinway grand to play a program of some of his own compositions, as well as works by Miles Davis and Duke Ellington. I listen, rapt, from about 20 feet away. He ends with a majestic performance of Gershwin’s “Rhapsody in Blue.” After the concert, we all feast alfresco on an outstanding farm-to-table dinner. From the outset, Moab’s striking natural landscape has been a fest hallmark. “What makes us so unique is how we’ve been able to marry beautiful music-making with these extraordinary places,” says Barrett. While a handful of concerts take place inside the historic Star Hall, most are held outside, some in local parks or at riverside guest lodges. More-intrepid concertgoers head out with a naturalist guide on half-hour hikes to a wilderness venue where the musicians play. 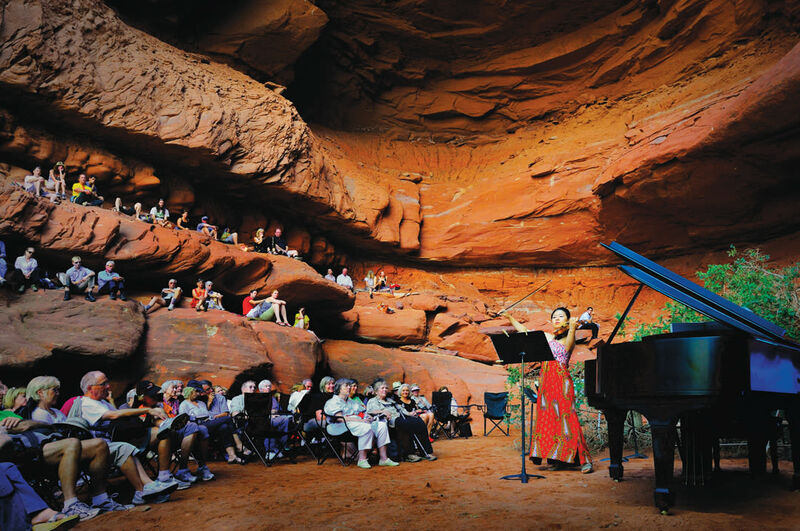 Most inspired are the three afternoon concerts held in a tucked-away grotto along the Colorado. And a pair of multiday guided raft trips bookend the schedule, complete with performers (and their carefully packed instruments) on board. The breadth of artists matches the range of venues. Barrett brings in leading musicians he knows personally. “Whether they’re a fiddle player or a classical pianist or a Latin trumpet player, these people are at the tippy top of their fields,” he says. This year’s performances, for example, include vocal group Take 6; an evening of Beethoven and Chopin; traditional fiddle music; and Tony Award-nominated soprano Lauren Worsham with pianist Kyle Jarrow (he wrote the book for Broadway’s SpongeBob SquarePants). Like all of the grotto performances, this one begins with a full minute of silence before the music commences. As a pianist and flautist play Bach’s Sonata in B Minor, the purity of sound within the natural amphitheater is nothing short of astonishing. When the audience claps, the gentle noise is like raindrops pitter-pattering onto the desert floor. This year's Moab Music Festival takes place August 27-September 13. Tickets for single performances range from free to $350. For lodging away from from the hubbub of town, consider a suite or cabin at Red Cliffs Lodge (there's a winery on-site too) or the luxury Sorrel River Ranch Resort and Spa; both properties will also host a Music Fest concert. In Moab proper, the Aarchway Inn offers comfortable motel rooms along with a large pool and landscaped grounds.